Using spreadsheet functions to update Shopventory inventory information. Bulk Upload is used for mass inventory updates via a Google Sheets® spreadsheet. It is helpful for initially setting up a large inventory or for making large-scale changes to existing inventory. There are different options depending on what changes you'd like to make. Select your option (see below) and then Shopventory will automatically generate a Google Sheets® spreadsheet for you to edit. You may copy/paste from an external spreadsheet program like Microsoft Excel, Numbers, or LibreOffice. Once you have made your changes, you can submit the spreadsheet to upload it into Shopventory. Create new products and variants in a spreadsheet. Assign SKU and barcodes, set location-specific prices, costs, and inventory quantities. Edit existing products in a spreadsheet. Allows editing product name, categories, description (plain-text only), and shipping information. Edit exiting variants in a spreadsheet. Allows editing variant name, SKU, and barcode, as well as location specific price, default cost, and inventory quantities. Edit inventory quantities and default costs at each location for each variant. Inventory counts will be adjusted to match the spreadsheet. 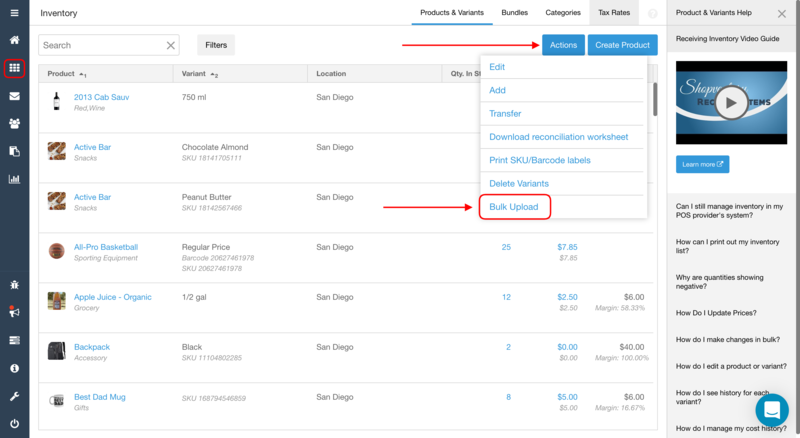 Fields can be left blank to skip importing costs or quantities for a variant/location. No changes will be registered for blank fields. NOTE: An item must be enabled at all selected locations in order to appear on this spreadsheet. Receive inventory for each variant at each location. Fields can be left blank to skip receiving any quantities. Create purchase orders for any location. This will create a draft purchase order for each location selected. Fields can be left blank to skip adding quantities to the created purchase orders. Create vendors that can fulfill Purchase Orders at your locations. A vendor will be created and associated with your selected locations. This will only create the Vendor entry. Images cannot be added via Bulk Upload. Google's spreadsheet API only allows for text-based information. Uploads cannot be undone! Make sure you read descriptions closely before proceeding as there is no option to undo. The Bulk Edit Inventory Quantities option will overwrite whatever is there. It's not recommended if sales are actively going through during the upload. If you are using any of the EDIT options at multiple locations, then only items enabled at every selected location will appear on the spreadsheet for editing. All errors displayed on import must be corrected before Shopventory can import the spreadsheet.